Facebook executives say companies need to approach Facebook as a branding investment initially rather than expecting an immediate, causal connection between a Facebook presence and selling goods. LOS ANGELES -- General Motors may have dialed back its ad spending on Facebook, but other automotive brands remain committed to aggressive social media plans with the online platform. Honda, Audi, Scion and Kia say Facebook is producing a sufficient return on investment to continue advertising and marketing ties with the social media site. This follows last month's decision by GM to slash advertising on the popular social networking site. Honda's recent Facebook activity to help launch the redesigned CR-V is one contributor to the crossover's five months of record sales, said John Watts, American Honda Motor Co.'s senior manager of digital marketing. "We're happy with what we're getting," Watts said, speaking at the TLS Automotive Social Media summit here Wednesday. Watts added that Honda's Facebook spend is "modest" compared with GM's $30 million budget. However, he said sponsored content -- paying Facebook for better placement of News Feed items -- is "worth it" in terms of the increased audience reach Honda's message receives. Doug Simpson, Facebook manager of global marketing solutions, said companies need to approach Facebook as a branding investment initially rather than expecting an immediate, causal connection between a Facebook presence and selling cars. But engaging loyal customers leads to word-of-mouth awareness and recommendation that other forms of advertising cannot buy, Simpson said. He said 88 percent of U.S. new-vehicle buyers are on Facebook, with 27 percent using Facebook during the purchase process. Facebook is also about data mining. A new analytics platform will give advertising partners access to the behavior and "likes" of those who follow their brand. That allows for much more targeted content and contact in the future, Simpson said. An example would include microtargeted advertising, such as using a Facebook fan's updated status to send him or her a college graduate or military incentive offer. While declining to comment on GM's decision to scale back marketing ties with Facebook, Simpson said: "We haven't changed our philosophy or strategy" as a result. "We still do business with GM, they have a page, and they are working hard to generate fans." GM has said it will drop the $10 million a year it spends on direct advertising on Facebook's site, such as pop-up ads. It plans to divert that money -- and possibly add more -- to the $30 million a year it already spends to create content for Facebook pages, which it deems more effective. 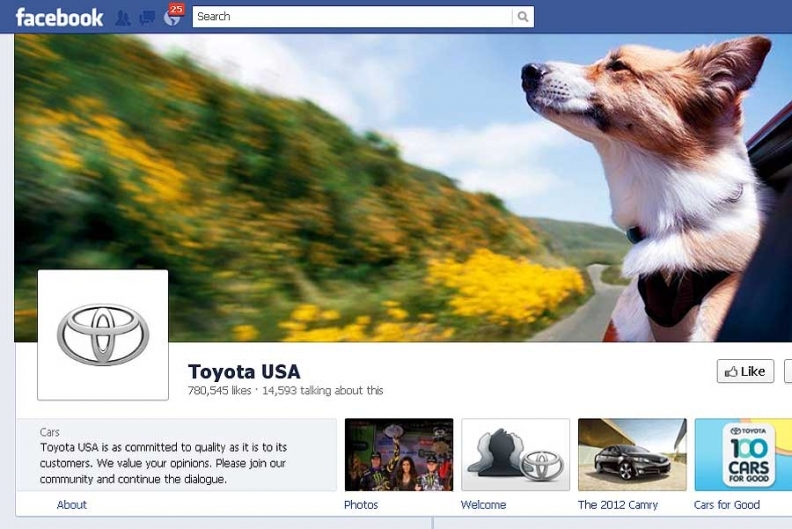 "We will continue to have a huge content presence on Facebook," a GM spokesman said. "We expect to significantly increase our spending on Facebook content. We've had great success engaging customers and fans on our product and brand pages." Audi of America has found a Facebook correlation to sales, said Loren Angelo, Audi's general manager of brand marketing. When Audi AG decided that the racy TT RS coupe would not come to the United States, Audi of America created a Facebook petition to lobby the parent company for the car. The petition said the signer would be willing to plunk down $50,000 for the car. More than 12,000 people signed up. Audi AG changed its mind to market the car in the United States, and Audi of America gained incremental sales, Angelo said. But, Angelo added, automakers shouldn't have to pay for sponsored content if their stories are sufficiently engaging and viral. "We don't do the things we think are cool. We do the things that our fans respond to," Angelo said. "We are more engaging than Justin Bieber and Lady Gaga." Owen Peacock, Scion's national manager of marketing communications, said the brand has Facebook screen shots "showing fans asking when the yellow Release Series tC goes on sale, getting directed to a dealership, then four days later, bang, 'Thanks, just got in the car.'" But Peacock cautioned: "You can't just rely on Facebook. There are too many people and too many choices out there. You may have 1 million fans, but if you think 1 million people are seeing your message, they're not. Their algorithms and formulas don't allow it." Facebook also has worked its way to the dealer level. An "employee pricing" advertisement posted on the Facebook page of Rick Case Honda in Davie, Fla., resulted in 100 cars sold during the first weekend of June, said Richard Bustillo, the dealership's general manager. The John Eagle Dealerships in Texas have recently tracked one dealership's 2,000 Facebook "likes" against vehicle sales and found no connection, said Jim Flint, the group's corporate director of interactive sales and marketing. However, when Flint traced those Facebook fans against spending in the Eagle service drive, he found a more engaged customer base that had spent $21,000 over the previous two months. Flint theorized that keeping those customers engaged could produce an additional $126,000 in service revenue over the course of a year. Facebook shares traded as high as $45 on the day it went public in May but later dropped to a low of $25.52 on worries that the site cannot sufficiently monetize its content. Shares have since rebounded to around $32.